Having completed Business Management and working in Finance industry for a while has actually made me wonder if i plan to continue in this sector for a long time. Can some of you please advise about the qualifications and the procedures / links for the same. For ATC in India, you need to be a B.E. Electronics with 60%. Apply when AAI AD comes up. Job growth is stagnant though. Thanks, Rutvij for the prompt reply. B.E. Electronics rules me out as i am from Commerce. Do you think there would be any roles except in the Admin / Front-end (customer service) that would be open for Business grads..? 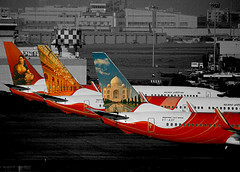 I wonder how many Airlines in India actually have their Fin Services dept in India ! Never heard of any openings in India..
Should be a good Opportunity though, as the Market develops. @Guy: Keep checking Airline Websites regularly. As a commerce guy, you options would be Sales/Mktg/Fin/Cust service roles unless of course you took science in school, in that case you could get into flight dispatch, operations etc. Can you tell me more about your Qualification / Experience? There are lots of open corporate positions in various airlines. I recently attended the Jet Airways interview for an opening in customer service.Due to age limit I was unable to apply for the post.Instead they gave me an option of applying for Cargo hold. But I could'nt make it there as well because of no experience in airline industry. Whereas I had 2 years of experience in ad sales. So if you want to get into finance,marketing or HR,then you have to start of as a customer service executive for atleast 2 years and then apply for the desired post.If your age is less than 25 yrs and you are only a graduate than it is the best time to apply for an airline job. Most of them who are currently working in Marketing,finance or HR have all started their career in airline industry either as a Customer Service Executive,Pilot,Ground Staff or Cabin Crew. One of the Jet Airways HR told me that on a very rare case they appoint an experienced people from other sectors. If you enjoy working odd hrs in tough climatic conditions with no Outtime. If you are willing to consider social life time on weekends rarely. If you have a Science stream especially PCM. I apologize for the delay in my replies. I have been on the run & haven't got an internet connection on my Laptop and all the while my sole connectivity was via my BB. Hopefully, I will get the internet connection sorted out in the next few days. I am 22 yrs old, Business Management graduate (2010, UK), currently working as a PMS Associate with a brokerage firm in Mumbai. I have prior experience of working with a leading Indian IT co as Tech Support in the ITO division as well. I am planning to complete a couple of assignments by June and make a switch. Lets see what roles I come across. I haven't got PCM, Mel. But mere paas, Finance, Marketing aur International Business hai..! Go to UK again, attend one of Cranfield or City's aviation MSc programmes, then try for the MIddle East Big 3 (EK,EY,QR) job and you will find it far more rewarding in the long run than trying to get into an airline here in India with just your UK Business Management degree. Else, continue to do what you are doing and actively take an interest by participating on forums like these, which is what many people here do. Some of them are far more knowledgable than HAWK21M or myself on matters aviation and you can be one too!!! You can also volunteer for a moderator job in these forums to further improve your knowledge .I understand from the "Site Related" postings here that some of the current ones are very seriously exhausted and wants to blood fresh minds with clear thinking into the job so as to take some well deserved rest!!! The second option, with or without the "moderator" add on is better than the first unless you have a lot of spare cash to invest.. if you have dont think twice and go for the first one without a second thought!! !